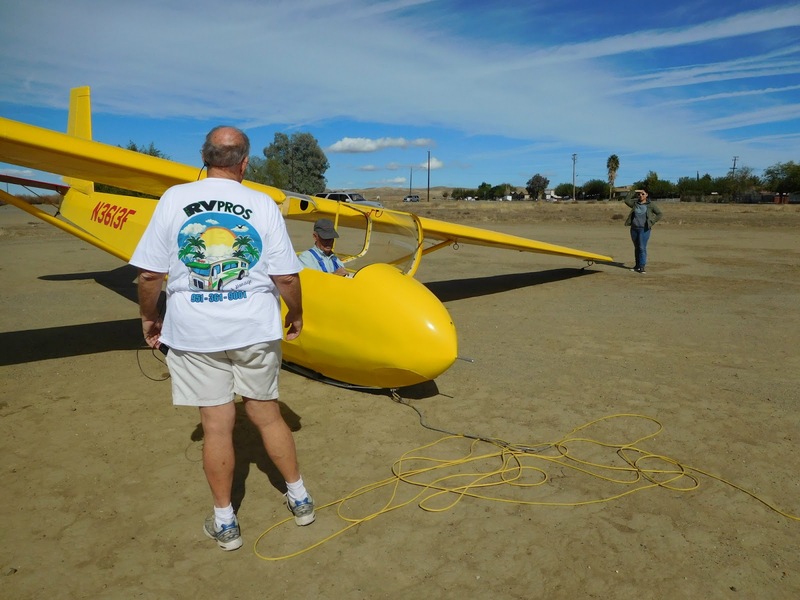 Central California Soaring Association: SATURDAY, October 29, 2016. 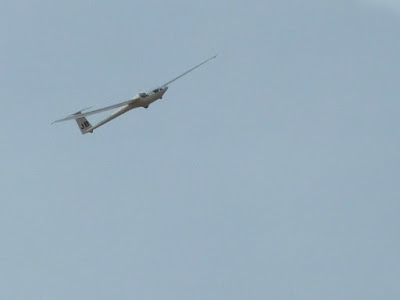 Felicia Ferrer's First Glider Flight. SATURDAY, October 29, 2016. 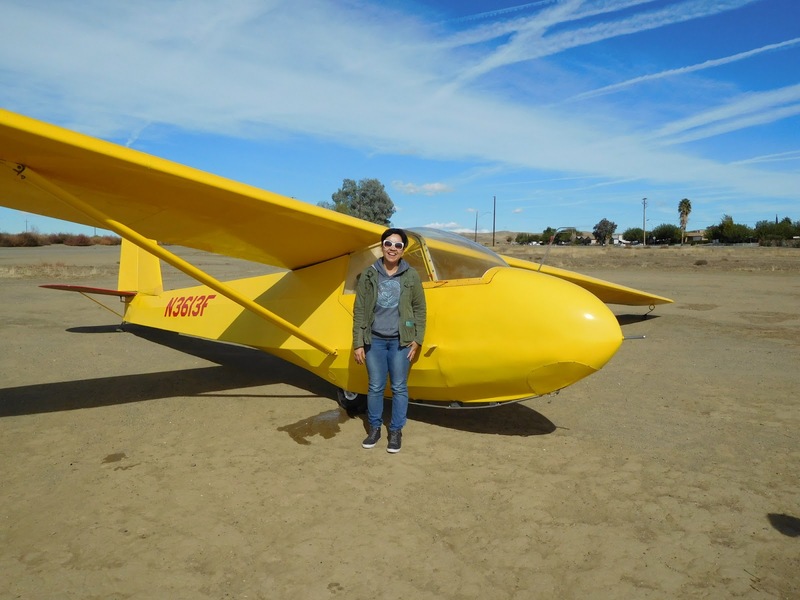 Felicia Ferrer's First Glider Flight. Wind: Light and variable from the SE, then SW. Comment: Not very many members flew today. Hardly anyone showed up.In fact, early one there were only four of us, Jim Bell, Felicia Ferrer, Jim Rickey, and me. Felicia was there for a demo ride, and Jim Bell for training. Later, Yutaka Buto and Troy Wollman arrived to make six, with Alex Caldwell seventh. The lift was spotty and erratic. Early on the cloud markers were everywhere and reasonable lift appeared underneath. But as time went on, the clouds would appear, disappear, appear in another location, and finally in mid-afternoon the high cirrus really took over and mostly killed the lift. In spite of that, Troy Wollman, flying the DG100, was able to find lift, stay up, but not get very much higher than 4400 msl that Felicia and I were able to reach during the demo flight. Even so, I compliment him on his ability to work whatever lift was there and it looked like he was having fun thermalling in the neighborhood. Jim Bell continues his excellent training and today he really GOT THE TOW. That's a normal progression because at first, trying to stay in position on tow is frustrating at best and downright defeating at worst. But at some point, most students just finally get it!! And from that point on, the tow begins to recede into their subconscious so that they can more easily learn other maneuvers with confidence. 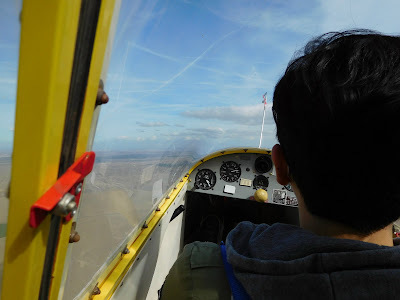 Jim is there and now we'll concentrate on the required maneuvers necessary for solo flight. 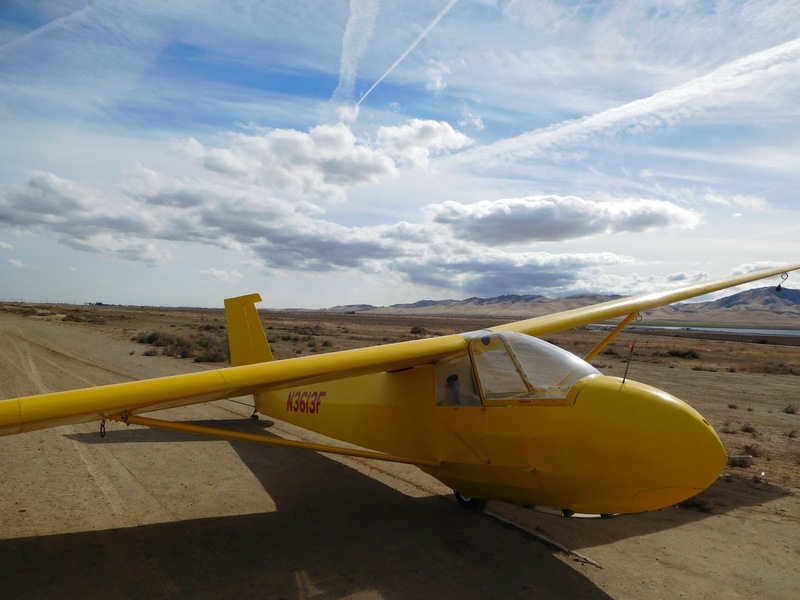 He's already got his nice shiny plastic student pilot license sent to him compliments of the FAA after fighting through the IACRA procedures. Jim Rickey decided to fly Big Bird when both Felicia and Jim were finished with their flights. Jim usually finds lift "where no man has gone before" but today the lift was meager and hard to find. The same experience confronted Yutaka Buto in the 1-26. He wasn't up too long before the erratic lift bedeviled him and he landed, quickly tying the glider down for the day. Felicia Ferrer before her first glider ride. She wasn't nervous at all. Jim Rickey is going to tow for Jim Bell and I. Jim did the tow better than ever and is moving toward solo. Out of necessity we enlisted Felicia in the fine art of wing running. She did very well. Felicia is looking forward to the experience of flight without an engine. She loved it. 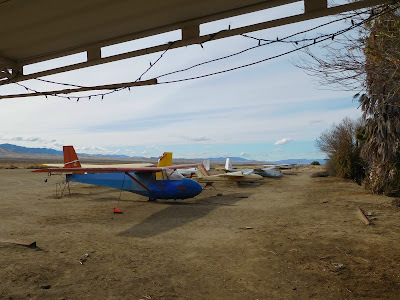 The clouds weren't too high and not very strong lift underneath but the day was beautiful for any flying. 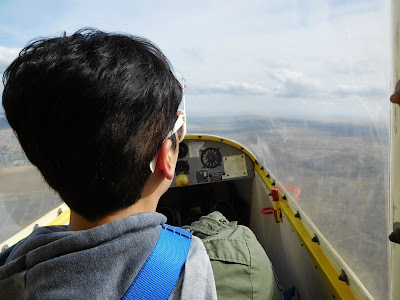 Felicia Ferrer had an enjoyable flight out near the West Ridge climbing to 4400 msl under a dark cloud. 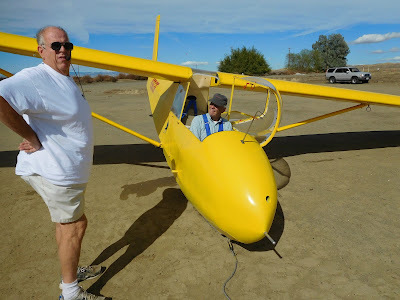 After Felicia, Jim Bell and I flew again, and this time Jim did even better on tow. 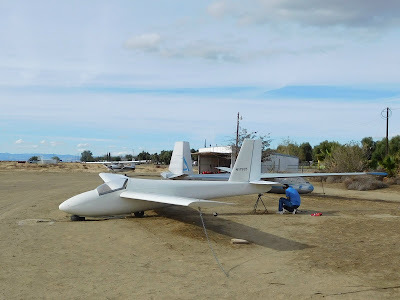 Yutaka Buto tying down the 1-26 after a not-so-great flight looking for lift that was disappearing quickly. As you can see, the high cirrus moved in and cut off whatever lift was there earlier. Somehow though, Troy Wollman flew the DG100 after we all had finished and he managed to stay aloft. 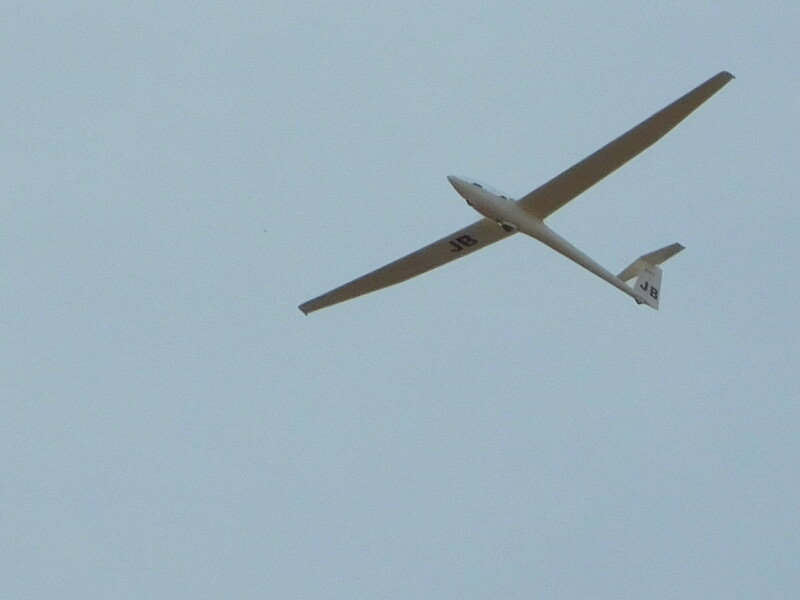 Troy was still flying near the end of the day when the few people there had already gone home. See you all next week when the weather will be just as nice as today. 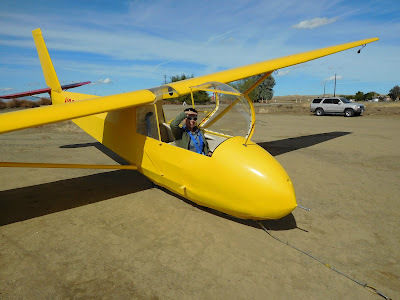 Remember, this is the BEST time of the year for glider training so if the spirit moves you, and learning to fly is on your bucket list, start now, don't wait, it only gets better now through March.